Trade unions, social movements, NGOs- from the UK, Switzerland, Canada, France, Turkey, South Africa, Spain, Nepal, and Germany have written an open letter to President Ivan Duque of Colombia in solidarity with around twelve thousand people from indigenous, Afro-descendant and peasant communities currently entering their 11th day of strikes and mobilisation in the Southwest of the country. The 'Social Minga in Defence of Life, Territory, Democracy, Justice and Peace', which started on March 10th, has been heavily repressed, resulting in up to fifty injuries. Authorities, and the president, have ignored communities' calls to meet with them, and are instead escalating military presence and violent action. The Minga is a legitimate expression of indignation and protest by the country's most marginalised communities. Indigenous, Afro-descendant and peasant communities are bearing the brunt of the reconfiguration of the armed conflict, following the signing of the Peace Agreement in 2016. Since then, the region has witnessed a burgeoning of paramilitary groups vying to control resource-rich territories, and an accompanying wave of violent militarisation on the part of the government. The result has been the country's highest recorded numbers of murdered human rights' defenders, and an unfolding humanitarian crisis which fundamentally denies the right to self-determination and autonomy of indigenous communities. Read our letter below. On behalf of the below-signed organisations– trade unions, social movements, NGOs- from the UK, Switzerland, Canada, France, Turkey, South Africa, Spain, Nepal, and Germany- we are writing to express our deep concern at reports from human rights organisations of your government’s violent response against unarmed protestors in Cauca department in the ‘Minga Social por la Defensa de la Vida, el Territorio, la Democracia, la Justicia y la Paz’. We also write to urge you to accept the invitation of the indigenous communities and social movements involved in the protests and meet with them in Cauca department, in order to engage with their legitimate demands which include concerns about the continuing murder and violence against activists, the right of communities to decide over extractive projects and other activities in their territories, and respect for the autonomy of indigenous peoples in their territories, as well as a long list of historic agreements between the Colombian state and social movements which have not been honoured by successive governments. We are particularly concerned by footage of security forces shooting gas canisters directly at protestors, and footage of the use by security forces of unconventional and unauthorised weapons including live firearms which endanger the lives of protestors, both in contravention of national and international standards. At the time of writing, human rights organisations report at least thirteen people injured, some seriously. 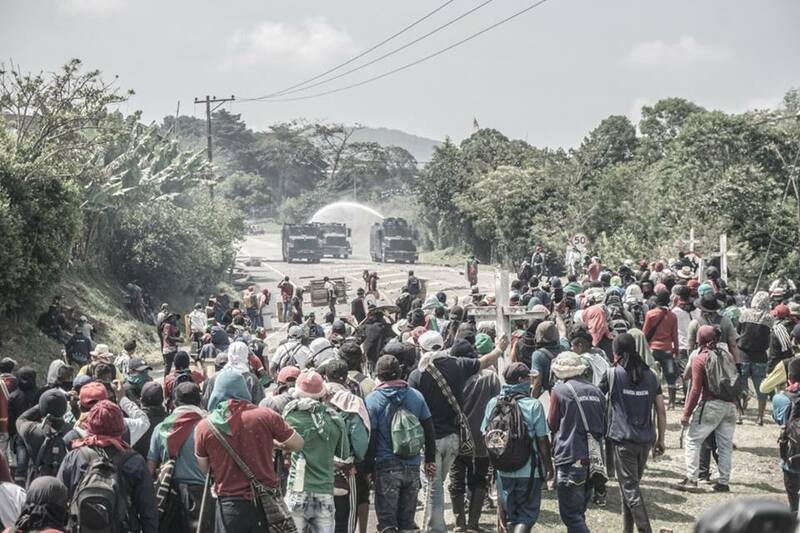 Act quickly to implement the just demands of the social movements protesting in the Minga.